Jody Levett was left to rue Worthing Raiders’ missed opportunity on Saturday. Raiders put in a below-par performance as they suffered a surprise 29-14 defeat at National 2 South basement boys Broadstreet. 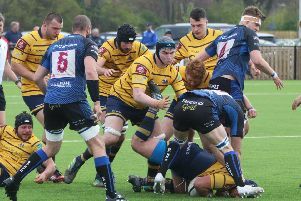 Worthing head coach Levett felt his side were not at the races for large periods and got what they deserved on the day. It was a first fixture in three weeks for ninth-placed Raiders, who would have moved back into the top half with a win as place-above Tonbridge Juddians were beaten. As it was, Worthing came away from Broadstreet with nothing. Levett said: “It was an opportunity missed in all honesty. “We probably didn’t deserve anything from the game. Despite having a number of chances to secure a losing bonus point and indeed potentially push for a win, we were not accurate enough to do so. “All credit to Broadstreet, they managed the game and conditions very well. Raiders ended a three-week wait for a fixture when they got things going at Broadstreet. Worthing’s last game came way back on February 17, when they were beaten at Tonbridge Juddians. A week’s break last month was then followed by a fixture postponement at Roundstone Lane but Levett refused to use that as an excuse. “It certainly didn’t help (going so long without a game) but Broadstreet were in the same boat, so that cannot be an excuse,” Levett added. Raiders now turn their attention to Saturday’s clash with Canterbury in what will be their first game at Roundstone Lane in just over a month.